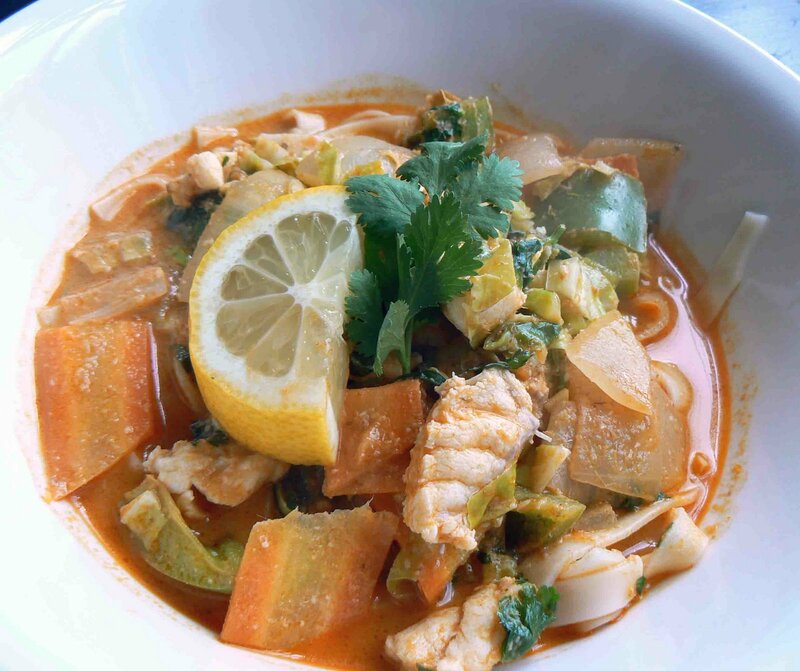 My hilarious attempts to speak Thai should not be left in Thailand, so I present to you: tom yum gai nam kohn – what I believe could mean fish soup with coconut milk. I can’t find exactly what ‘tom yum’ means, it could describe the sauce or could be the word for soup, but it is a very popular dish in Thailand. Tom yum goong (tom yum with prawns) was one of my favourite meals during out trip and so when I saw tom yum paste in Wing Yip, our local Asian supermarket, I had to get some. I know mixing a sauce in with some vegetables and protein isn’t much of an achievement, but I was pleasantly surprised by how this came together. Guided by the servings per jar, I used a tablespoon and a half of tom yum sauce (which made the soup -ahem- very very very spicy), fried it with onions and green peppers, then I added reconstituted creamed coconut, juice of half a lemon (lime is the best, but we didn’t have any), some carrot, some cabbage and at the last minute some cubed fish. I used monkfish because we happened to have some in the freezer from the last time I fell foul of the fishmonger, and its firm and meaty texture really stood up to the spices. I added some rice noodles, which sucked up some of the soup but it was worth it! Next time I will use less tom yum sauce (oh the joys of a new ingredient!) but overall I was very pleased, and it proved to be a less fearsome version of a hot and sour prawn soups I’ve made in the past. When I had peashoots the other week, the back of the packet said it made a very nice soup with bacon. 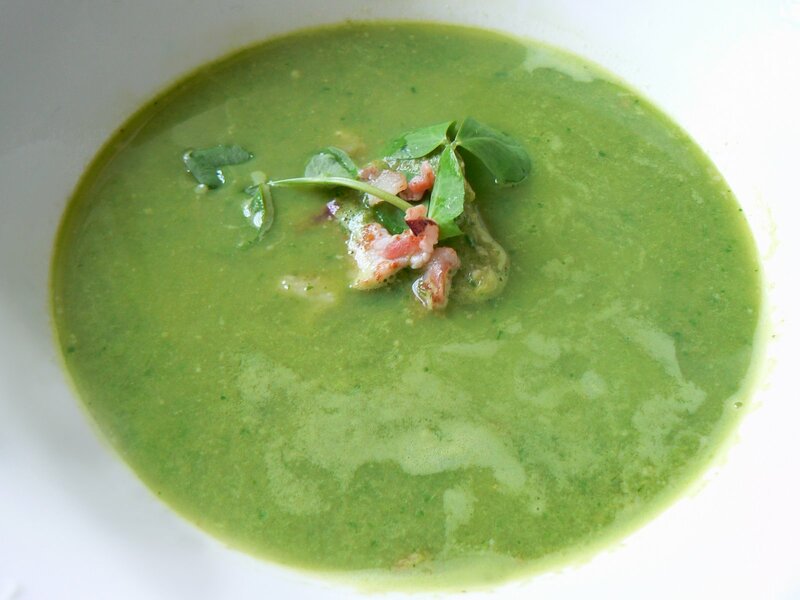 So I had a go, and this made for a summery version of pea and ham soup. To make the soup for two, I used four shallots, two rashers of bacon, a packet of pea shoots, ham stock from the freezer and salt and pepper. I cooked the shallots and bacon, added the stock and seasoning and let it simmer for a while before adding the peashoots at the last minute. I whizzed the lot up (this was very difficult as the peashoots were determined to escape) and it made this pleasuringly lurid soup. It was tasty, and I think I will cook it again as long as the peashoots are in the shop. I kept some shoots and bacon aside as a garnish, but unfortunately it sunk as the soup was thinner in consistency than my soups usually end up! Please excuse the recent obsession with lamb, but I’ve never liked it before and we keep finding it on offer. 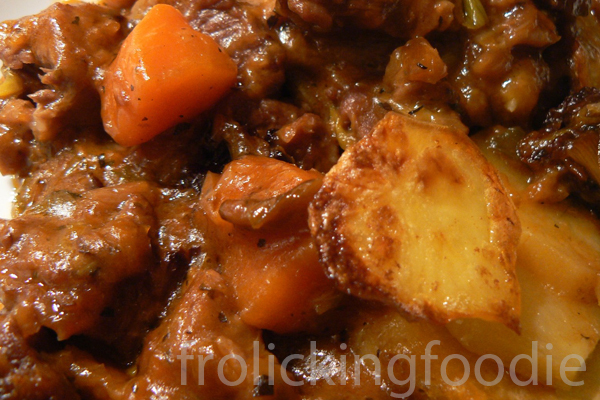 This is SO quick to cook, and would work very well with beef too. I used half an onion, a red pepper, a green pepper, some mange tout and a handful of pea shoots (what I had left over from the weekend) – any old veg would work well. The sauce is what the recipe’s about really. I’ve always been apprehensive about Chinese 5 Spice (easily found powder in a supermarket) as it always smells strongly of liqourice. But I gave it a go, and it was DELICIOUS. SO for two, whisk up the following in a little dish and marinade the finely sliced meat in it. Marinade the fincely sliced meat (as much as you choose) in the sauce. 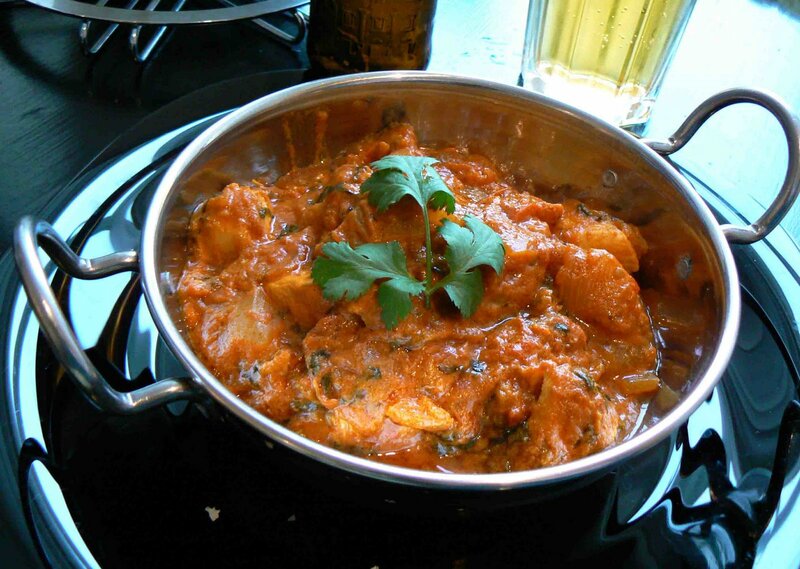 Heat a wok with some oil, then throw in the meat and sauce, cook for barely a few minutes to keep the meat tender. 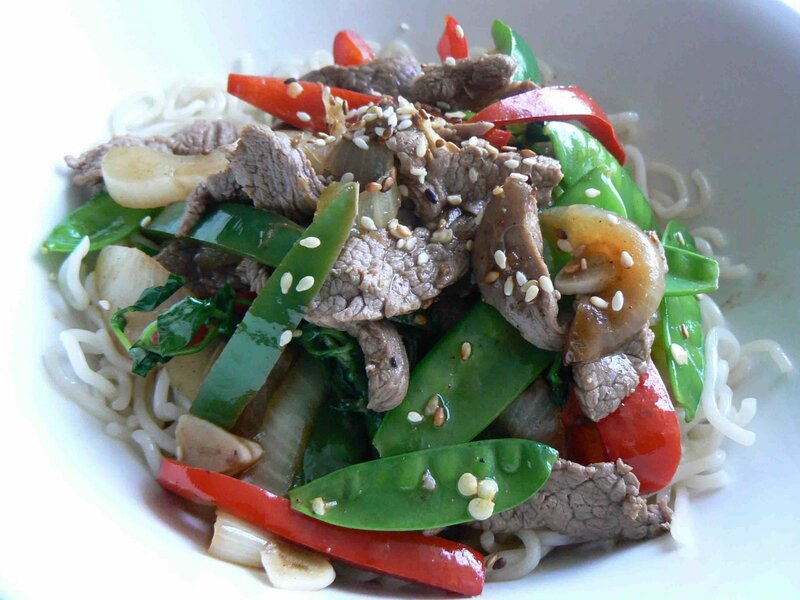 Set the meat aside, then cook the onion and peppers and hardier veg for a few minutes. Add the mangetout and lighter veg and cook for maybe a minute longer. Take the wok off the heat. Add the cooked meat and sauce back, stir it in and let it sit while you plate up the noodles or rice. The meat will warm through again and the sauce will have a chance to coat the veggies. And that is that. 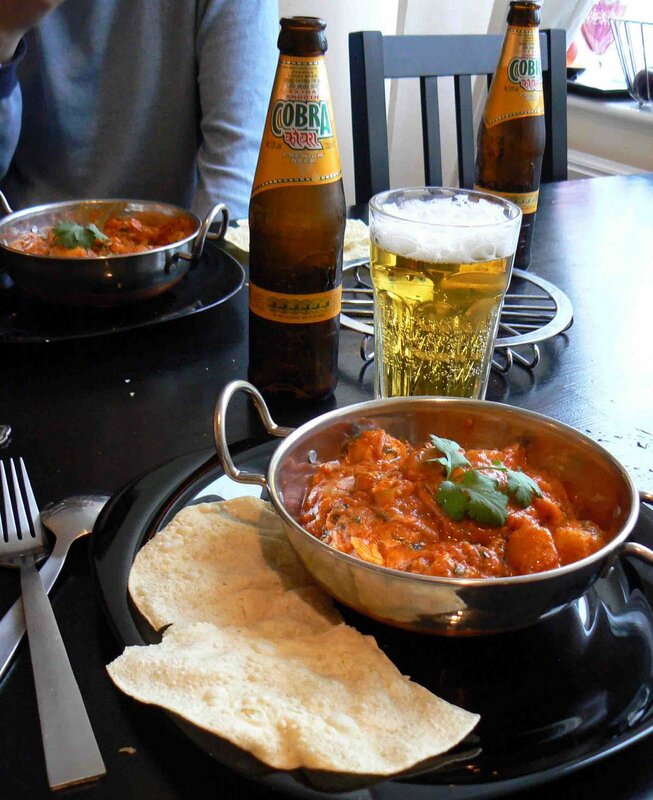 Superfast and delicious. I’ve been searching for orzo for months – none in M&S, Sainsbury’s, Asda or Morrison’s – but today I stumbled across a shelf of orzo in the world foods section of an out-of-the-way Tesco. I was so happy. So what’s an orzo when it’s at home? 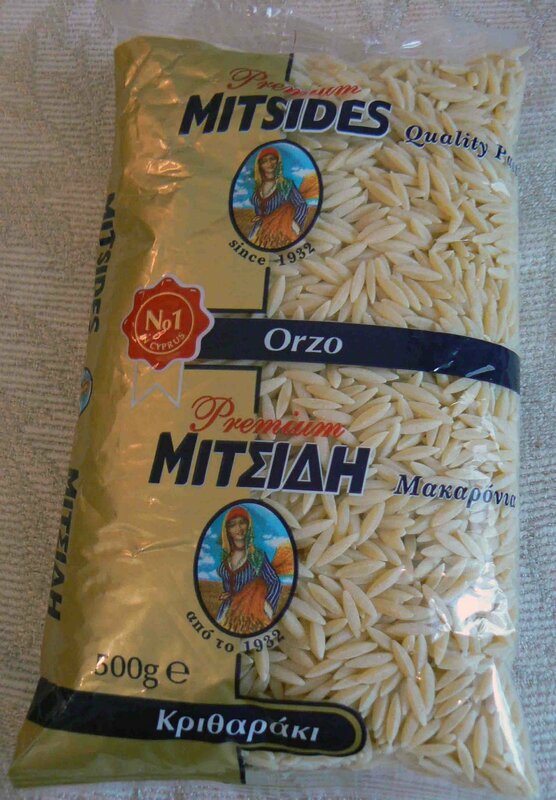 As far as I can tell, it’s a Mediterranean rice-like pasta, often used in soups but equally in salads (this is how I found out about orzo on a flight to Honiara from Fiji strangely enough!) and served as any other warm pasta. As someone who dislikes rice and doesn’t particularly succeed in the cooking of it, orzo is my perfect solution. And at 45p for a 500g bag, it’s pretty good value too! 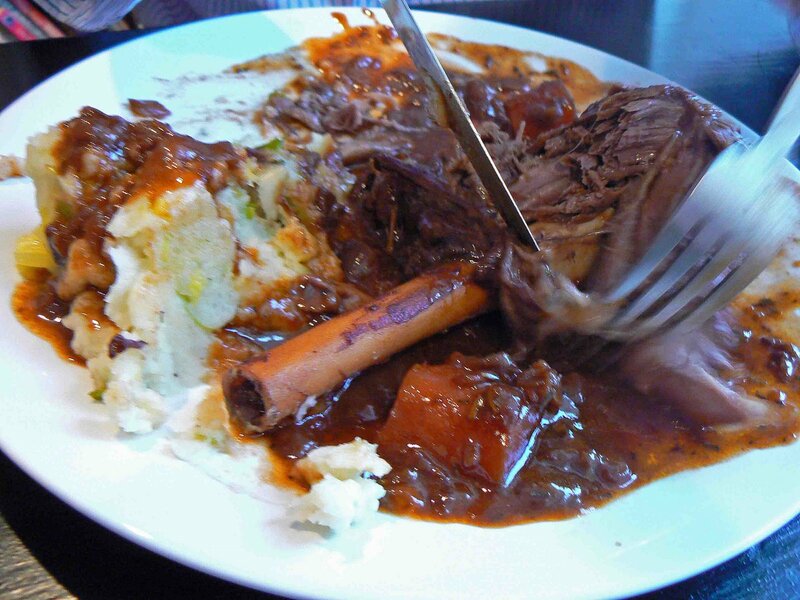 I’ve had stifado on my mind for a while. 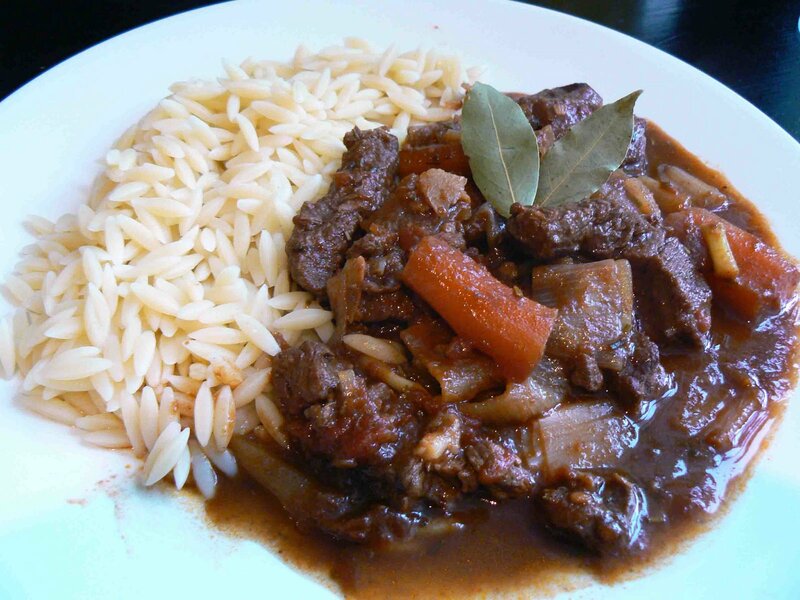 Again, from what I gather it’s a Greek beef and onion stew – but any meat seems to go and any variety of veg chucked in too. Its hallmark is the combination of wine, wine vinegar, cinnamon, rosemary and sometimes honey to make an aromatic almost sweet and sour stew. My recipe called for the addition of potatoes, but I wasn’t in a potato mood so I was going to go for a doorstop of bread to soak up the gravy until I spotted the orzo and I knew I had to have it with the stifado. Is it unorthodox? Who knows, but it was a pretty good taste combination. In a large pan, cook the shallots and garlic over a low heat for about 5 minutes until coloured. Remove from pan and brown the beef in batches. Add the shallots and garlic back. Tip in the tomatoes, stock, wine, red wine vinegar, salt, pepper, rosemary, cinnamon, bay leaves and honey. Bring to the boil and then turn down to a simmer and cook for 2 hours on the lowest possible heat until meat is tender. I’d never liked lamb until this year, really. 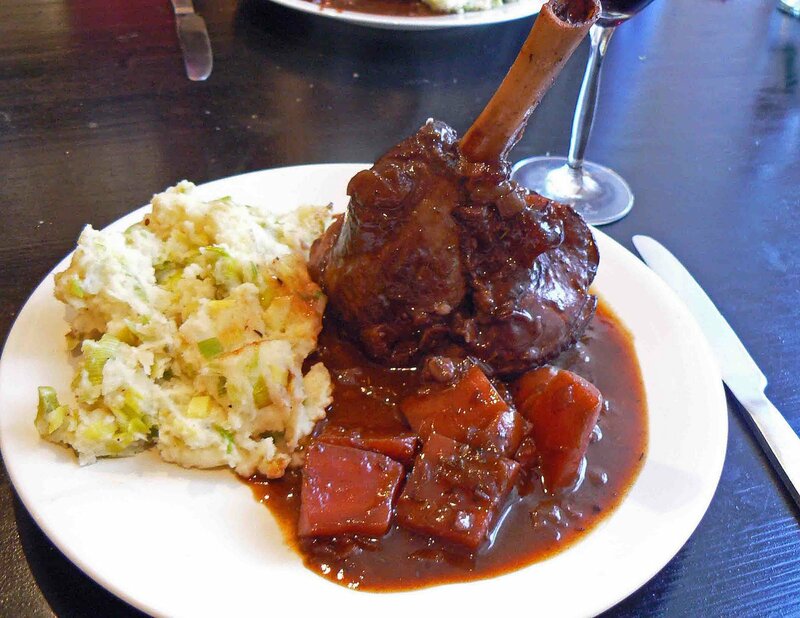 I’ve tried a forkful of lamb shanks at a restaurant once and it was decidedly yummy so when I saw two lovely large (and heavily reduced) lamb shanks at the supermarket, I snapped them up. A quick google found a recipe (which I adapted, of course) and it turned out wonderful and almost entirely effortless. The dinner may be lacking in the 5-a-day (onion, carrot and leeks in the mash) but it was delicious and greedy. First, brown the lamb shanks in your pot on the top of the oven. This will take about 8 – 10 minutes. Remove the lamb and put aside. Saute the onion and garlic with the salt to make it soften a little (4-5 mins) then add the carrots, pepper, rosemary, thyme, lambshanks, red wine and tomato puree. Cover and simmer for 2 hours. Perfection is reached when it’s tender enough to fall off the bone easily. Yesterday I had a lovely day pootling around, went to the fresh fruit and veg markets, trawled the butchers etc but I had my heart set on fish for dinner. I popped into the fishmonger’s and the scallops called to me. I absolutely adore seafood, scallops in particular for their firm texture. I’d never eaten the coral roe (the orange part) of a scallop before, as they’re usually taken off and discarded. After a quick browse on the net, there seemed to be no reason for not eating them (except if the fact they are gonads freaks you out). So yesterday evening I simply used a lot of butter, a bit of garlic, a tiny bit of white wine and some lemon juice and had a delicious scallop starter. To cook them, I added a hunk of butter and a minced garlic clove on a medium heat. I added the scallops, cooked them for a few minutes on either side then added the wine and lemon juice and let them simmer slightly until the garlic was cooked through and the scallops had lost their translucency (a sign that they are cooked). This took only a minute or two longer. They were simply perfect. TLM (who did not partake in the scallops – more for me!) sat bemused as I at them with complete relish and pleasure. The roe was actually very tasty (even though TLM kept sayin ‘gonad’ as I ate *roll eyes*) and had the texture and taste of a mild mussel. I’ve had a look around and have seen scallops with small slices of tart apple, maybe I’ll try that another time. Before Christmas I found a great book in a charity shop called ‘One Pot’ that is just full of dishes cooked in – you guessed it – one pot. Casserole, stock pot, wok, bowl: the raw materials go in and then come out magically transformed. Love it. I’d never cooked lamb before, and this casserole ended up being delicious (which pleased me greatly!). It’ll be my dish the next time I cook for friends. I sliced and par boiled the potatoes I wanted for the top, so after the 1 1/4 hours of cooking I put the potatoes on top, pinched some butter over them and whacked the temperatue up to 220 celsius and cook until they’re browned – about half an hour. I might do the potatoes separately next time so I can be more in control of when it all comes together. This dinner was delicious, and quite unique in its flavour. I was worried about the apricots, but the whole thing melded together and was just sweet and complimentary to the lamb, the sauce was almost toffee-ish. One to add to my folder of favourites. On Saturday we went to our local farm shop and picked up some wonderful ingredients, including beef and brocolli. 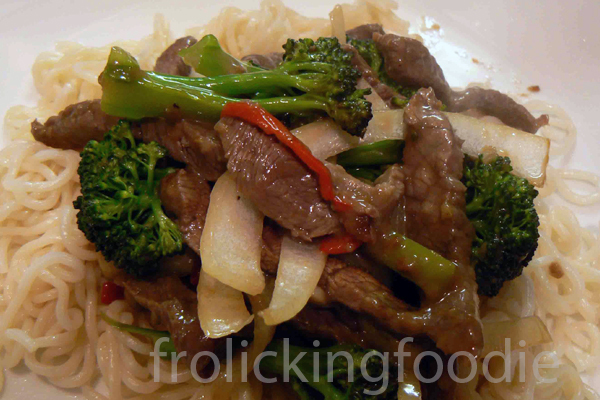 I love beef stir frys, but I’ve never cooked one at home before. So with the coupling of an excellent piece of meat (I trust cooking it quickly if it’s good quality) and a super sharp knife I set to work. Slice the beef as finely as you can and then marinate the beef for at least 20 minutes, or overnight if you’ve thought ahead. 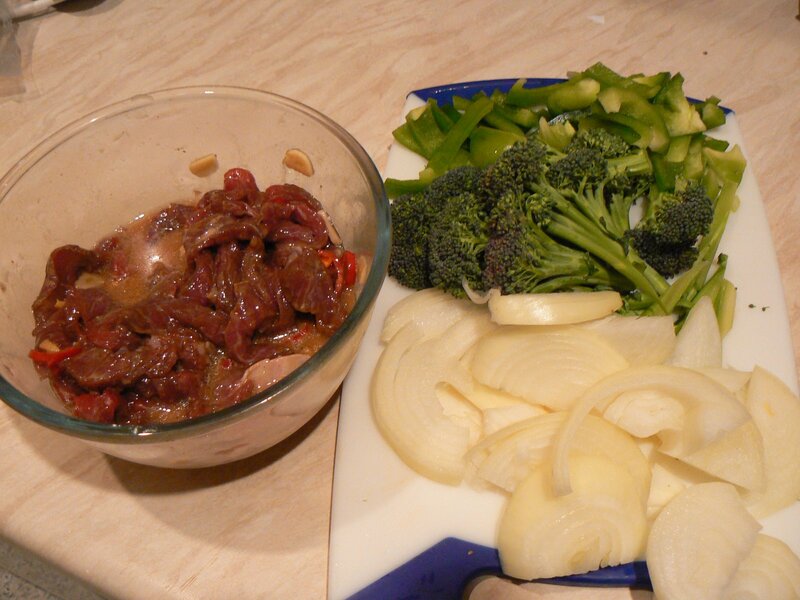 Then stir-fried the lot: onions first, then take them out, followed by beef, then take it out, then the green veg, then re-add the beef and onions. If I were to do this again I would cut the beef even thinner so I could cook it in 2 minutes rather than 5 (approx).